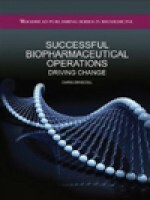 Successful biopharmaceutical operations provides a practical guide to transforming biopharma companies into industry leaders through a focus on driving change. The industry has a blind spot concerning this kind of work, because successful change management comes from a focus on people, while our technically-minded ranks invariably prefer a technical focus. This cognitive bias causes us to pick up the tools we like the best and to swing them enthusiastically - whether they are working or not. This book provides new tools, and readers gain an understanding of how biopharma organizations developed into the cultures we see currently.